The stormwater garden in this photo was an environmental accomplishment for the City, diverting runoff from State Highway Rt. 9 (Main Street) into the heart of the Park. Wild stands of Thalictrum ‘Lavender Mist’, Aesclepias tuberosa, and New England Aster colonize the Tupelo grove at the southern edge of the bioswale. 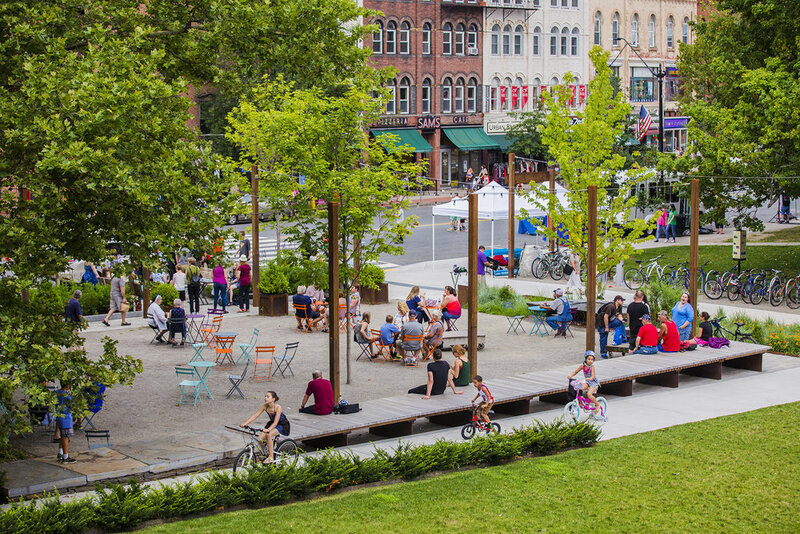 STIMSON created a new Main Street Plaza with moveable furniture, custom steel planters, decomposed granite and permeable pavers. Trees were grown by our nursery @charbrookfarm and provide seasonal shade. An expansive urban lounge of black locust, Goshen stone and weathering steel defines the edge of the plaza from the new civic green. An irregular slab of Goshen stone from Sugarledge Quarry was carved into a water feature at the Main Street Plaza, overflowing into the bioswale before recirculating. It has become a watering hole for children, birds and even dogs.